Women in Saudi Arabia – Is There Real Reform? Saudi Law Defines Terrorism As Defaming The State! Saudi Diplomats holding slaves in Virginia? Updated October 11th – More newspapers ads listed! The Religious Freedom Coalition advertising campaign to expose the evils of Saudi Arabia is an ongoing effort. Our current ad details the arrests of Ethiopian Christian guest workers in Saudi Arabia for the “crime” of praying in private. The ads, which are placed in key congressional districts, direct readers to an Internet site where they learn more about the persecution of Christians in Saudi Arabia. Once at the Internet site, a free fax can be sent to the reader’s congressman asking him to speak out against the brutality of the royal family which operates the criminal enterprise known as Saudi Arabia. the free fax to your congressman here! 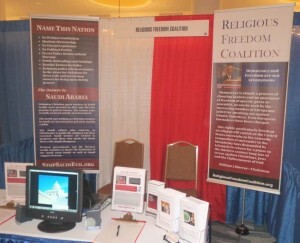 The ad first ra n in Orlando, Florida during a national convention on social conservative issues – The Awakening. William J. Murray was one of the speakers at that event and several congressmen, including Michele Bachmann, were also present. 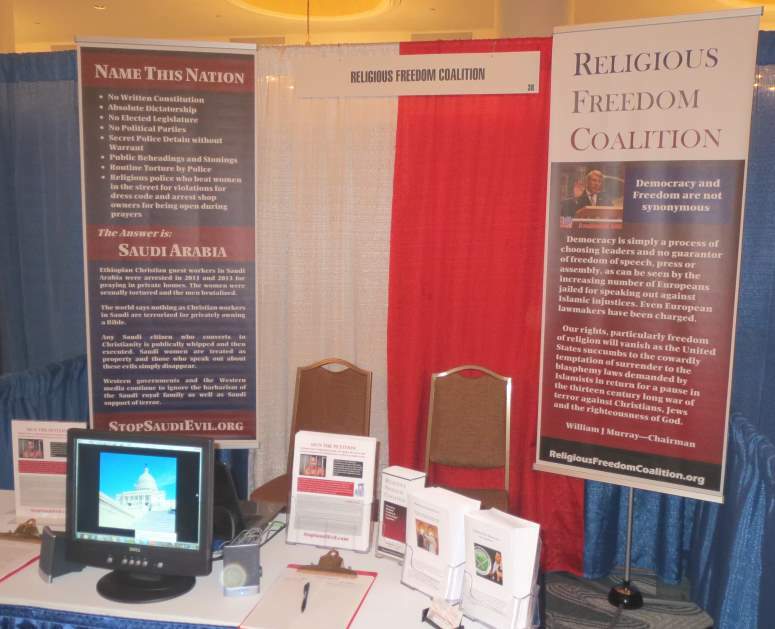 The Religious Freedom Coalition had a display that included large banners about the newspaper advertising program. The second newspaper ad targeted the district of Darrell Issa (R-CA) who is the chairman of the Government Oversight Committee. Darrell Issa’s district was also chosen because it is the home of Camp Pendleton, and Marine families are well aware of the abuses that occur in and around the Saudi sphere of influence. Since then the primary targets have been members of the Foreign Relations Committee. As soon as enough petitions are generated staff of the Religious Freedom Coalition will begin the lobbying effort for congressional resolutions condemning the persecution of Christians in Saudi Arabia. Ads that have run or are scheduled appear in the chart below. Free fax to your congressman here!